Chelsea retain a glimmer of hope in their pursuit of a Champions League place, but even their victories can not escape the lingering whiff of discontent. Alvaro Morata's hissy-fit upon being subbed just after Victor Moses 69th-minute winner probably ended his chances of a Wembley FA Cup semi-final appearance on Sunday. In fairness, another limp display from the striker, including a shocking miss early in the second half, probably made that inevitable. He showed his disapproval when Antonio Conte responded, the centre-forward kicking the turf and slamming shinpads onto the ground once seated having been replaced by Eden Hazard. Moses and Kevin Long's first-half own goal still secured the points at Turf Moor. It was an unusually sloppy defeat for the hosts after Ashley Barnes had equalised with a freakish deflection. 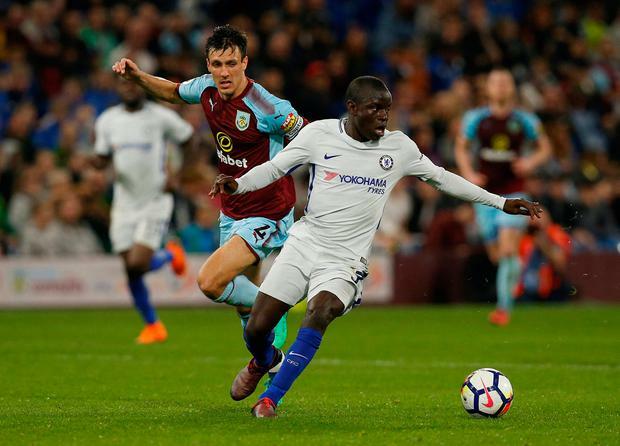 Chelsea were robust rather than fluent - particularly in defence - although, given they were much-altered, it was a creditable victory to retain Conte's aspirations of a purposeful conclusion to the season, and most likely his reign. You know it is a curious Premier League table when Sean Dyche's stock as a manager is higher than Conte's. Burnley presented a reminder of where Chelsea's title defence began to go wrong. August 12, to be precise, when Dyche's side opened the season with a 3-2 win at Stamford Bridge. There has been a feeling ever since the Italian is seeing out his time at Chelsea, so it came as no surprise his team selection had a retro feel to it - a reminder of those times when managers rested players in the league for crucial FA Cup ties rather than vice-versa. 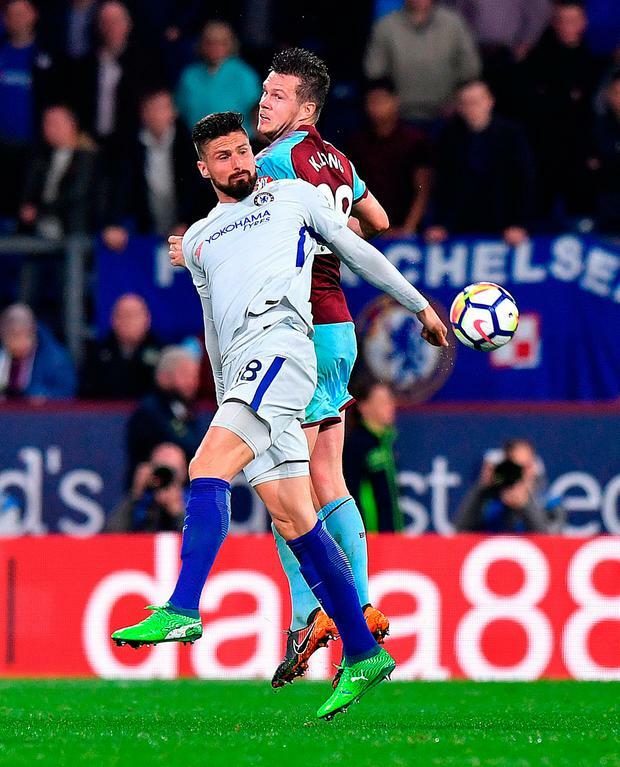 There was an old-school look about both sides' use of four target men, too - Olivier Giroud paired with Alvaro Morata, Chris Wood with Ashley Barnes. To be fair, the Chelsea duo showed some encouraging signs of working in tandem, or at least the enthusiastic Giroud demonstrated a willingness to make it work. They probably won't be paired again, of course, but the experiment was not without merit. Chelsea's was a patched-up line-up, particularly as Marcus Alonso's suspension for stamping Southampton's Shane Long was confirmed before kick-off. More changes followed. Given Conte is unlikely to be around whether Chelsea are in the Champions League next season or not, he can be forgiven for prioritising this weekend's semi-final and letting his successor deal with any Premier League repercussions. Emerson made his first start. It meant Eden Hazard, Willian, Cesc Fabregas and Andreas Christensen began on the bench. If that was no shock, Ross Barkley's failure to get a start in the light of so many other changes was more surprising. The midfielder must hope the next coach sees what Conte has evidently missed. For Burnley, there is pride and a little disbelief they may be peers of Chelsea in the Europa League next season. Dyche probably would have left before the season, or even in the middle of it, had one of the wealthier clubs given him the opportunity. Instead he signed a new contract. He won't regret being denied the dilemmas if his CV is decorated with UEFA qualification - although there must be bewilderment at how hesitant chairmen are to headhunt him. The Burnley faithful were immediately encouraged by the intent of their side, hoping to identify a gulf between a side fighting for a prized qualification and another resigned to an unwanted consolation below the top four. Instead, the Chelsea extras showed their desire was not as compromised as the manager's selections, Morata sent clear by Giroud's clever flick and forcing Nick Pope into the first meaningful action on ten minutes - an easy save from a tight angle. Conte's side took the lead on 19 minutes, Gary Cahill's diagonal picking out Victor Moses whose tame cross somehow bewitched Pope and Long. The keeper's fingertip onto the chest of the retreating centre-half did the damage. More sophistication was needed to ruffle Chelsea's back three, however. The Burnley fans remained encouraged, heartily applauding the half-time whistle despite awaiting the home team's first shot on target. Morata's unconvincing debut season was summed up when he was sent clear on 54 minutes. With time and space to beat Pope he picked his spot an inch wide. How Chelsea have missed Diego Costa. 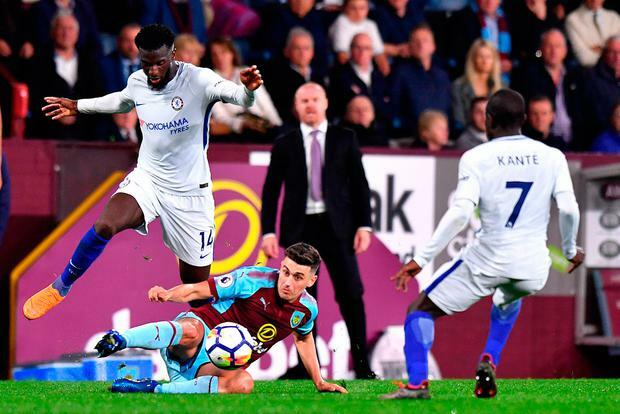 Chelsea paid for Morata's sloppiness when Burnley struck a fortuitous equaliser on 64 minutes. The visitors felt Moses was fouled in the build-up, but the ball was worked to Johann Berg Gudmundsson whose hopeful strike deflected off Barnes heel, wrong-footing Courtois. Chelsea appealed for offside. It wasn't. Not surprisingly, Morata was replaced shortly after, Hazard introduced. The Spaniard did not disguise his feelings, the tantrum beginning as he made his way off and continuing on the bench. Conte will not care. His side had already restored their lead by then, although it owed much to Burnley's unusual loss of concentration. Moses was inexplicably free in the hitherto congested Burnley penalty area to slam past Pope on 69 minutes.